TrueTouch® Eye Makeup Remover—Duo Phase is a unique, liquid formula perfectly crafted for powerful and thorough eye makeup removal. It provides an “oil phase” to gently dissolve waterproof eye makeup (featuring a gliding slip to minimise unnecessary tugging on delicate eye tissue), and a “water phase” to eliminate water soluble eye makeup while conditioning eyelashes and surrounding skin. This mild formula effortlessly clears delicate skin of the most stubborn eye makeup and other residues, preparing it for effective cleansing. Dissolves even stubborn waterproof eye makeup quickly. Renders lashes and surrounding skin softly conditioned and healthy looking. Clears delicate skin of eye makeup and other residue, preparing it for effective cleansing. 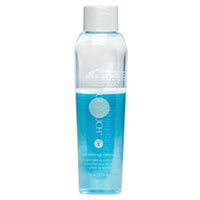 Use this duo-phase eye make-up remover prior to cleansing. Shake well before use. Apply to cotton pad. Gently remove eye make-up. Follow with cleanser. Decyl Glucoside—This extremely mild water-based cleansing agent is plant-derived and biodegradable. Isohexadecane—This oil-based emollient gently dissolves stubborn waterproof makeup without leaving a greasy residue. Potassium and Copper Salts—These mineral salts help gently buffer the formula.